Cambridge, Mass. – August 20, 2013 – Applied physicists at the Harvard School of Engineering and Applied Sciences (SEAS) have demonstrated that they can change the intensity, phase, and polarization of light rays using a hologram-like design decorated with nanoscale structures. The demonstration of this nanostructured hologram has become possible only recently with the development of more powerful software and higher resolution nanofabrication technologies. The underlying design is more complex than a simple superposition of nanostructures onto the hologram. The phase and polarization of light closely interact, so the structures must be designed with both outcomes in mind, using modern computational tools. Further research will aim to make more complex polarized holograms and to optimize the output efficiency of the device. Genevet’s and Capasso’s collaborators included co-lead author Jiao Lin, a former SEAS postdoctoral fellow who is now at the Singapore Institute of Manufacturing Technology; Mikhail Kats, a graduate student at Harvard SEAS; and Nicholas Antoniou, principal focused ion beam engineer at the Center for Nanoscale Systems at Harvard University. This research was supported in part by the Air Force Office of Scientific Research (FA9550-12-1-0289); the National Science Foundation (NSF), through a Graduate Research Fellowship; and the Agency for Science, Technology and Research (A*STAR) in Singapore. 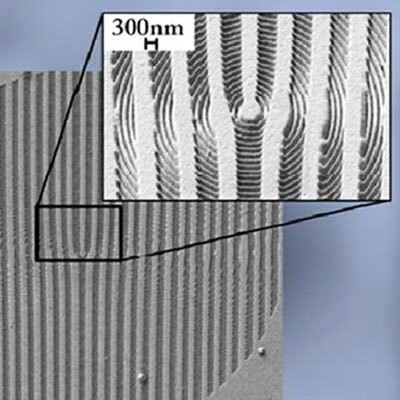 Device fabrication was carried out at the Center for Nanoscale Systems at Harvard University, which is a member of the NSF-supported National Nanotechnology Infrastructure Network (ECS-0335765).